For the first time since a cholera epidemic believed to be imported by United Nations peacekeepers began killing thousands of Haitians nearly six years ago, the office of Secretary General Ban Ki-moon has acknowledged that the United Nations played a role in the initial outbreak and that a "significant new set of U.N. actions" will be needed to respond to the crisis. 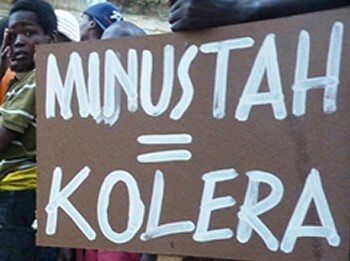 KREYOL: Finalman, Nation Unies admèt ròl yo nan epidemi Cholera a en Haiti... Yo fè konnen you pral prezante yon repons nan mwa k'ap vini la yo... Kisa ou panse de sa??? The deputy spokesman for the secretary general, Farhan Haq, said in an email this week that "over the past year, the U.N. has become convinced that it needs to do much more regarding its own involvement in the initial outbreak and the suffering of those affected by cholera." He added that a "new response will be presented publicly within the next two months, once it has been fully elaborated, agreed with the Haitian authorities and discussed with member states."